Columbus, Ind. 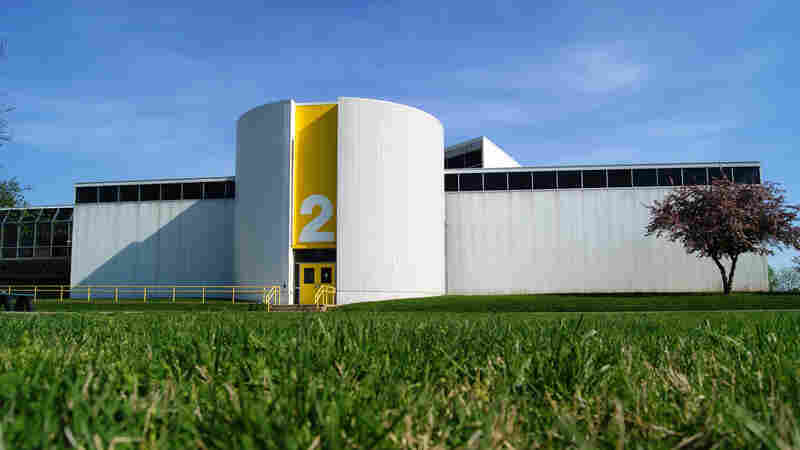 : A Midwestern Mecca Of Architecture Thanks to one trailblazing industrialist, more than 60 of Columbus' buildings — including schools, churches and even a jail — were designed by a veritable who's who of modern masters. As one local tour guide puts it, "We don't build anything that isn't attractive." 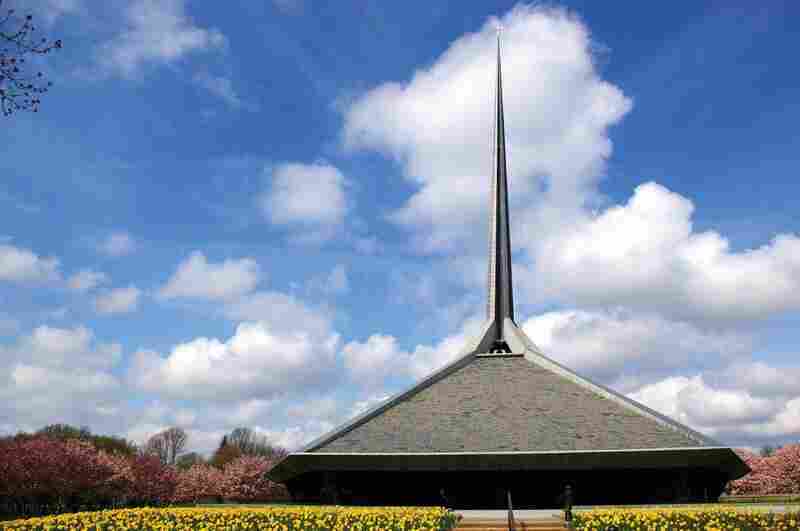 Architect Eliel Saarinen's First Christian Church (1942) helped launch a design revolution in Columbus, Ind. Nearly 30 years later, as part of that same movement, sculptor Henry Moore created the 20-foot-tall Large Arch as a public art work that could be walked through and around. Across from the First Christian Church, I.M. 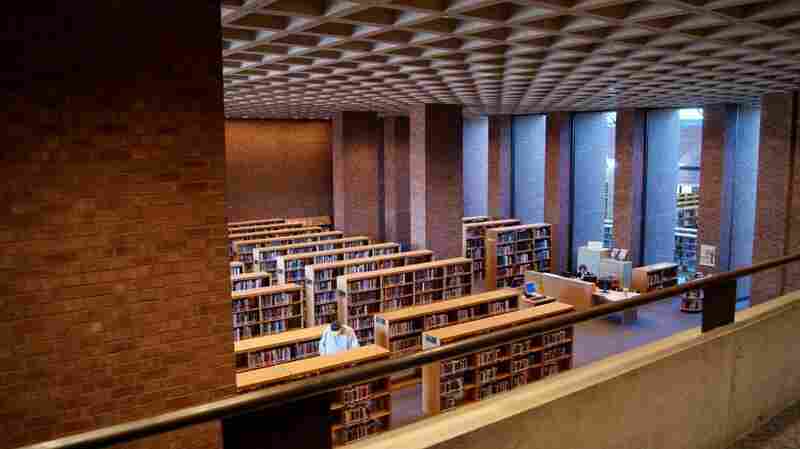 Pei's Cleo Rogers Memorial Library boasts a waffled concrete ceiling that, with help from an elaborate intake system, uses heat from the ceiling lights to warm the building in winter months. 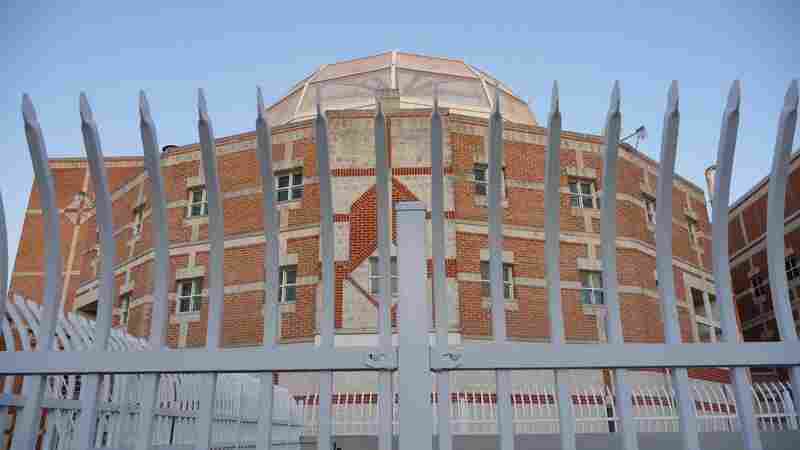 Designed by Don M. Hisaka in 1990, Columbus' brick and limestone Bartholomew County Jail is one of many public buildings to come out of the town's architectural fever. The Columbus Signature Academy Fondrea Campus primary school was designed by Paul Kennon in 1973 as a "people-centered" school to be used for both education and community gatherings. The house Will Miller grew up in was designed by Eero Saarinen on a grid in which each corner is used for a space that requires privacy, including the master, family and guest bedrooms. Inside, the sunken "conversation pit" allows for plenty of seating without visual clutter. 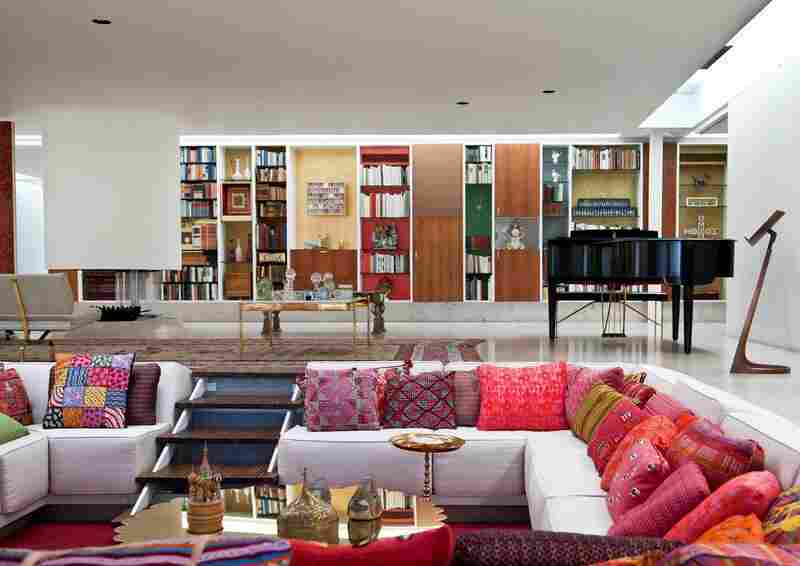 Architect and designer Alexander Girard worked with Will Miller's mother, Xenia Miller, on the house's interior decoration, which includes a selection of textiles that changes seasonally and a 50-foot-long storage wall. Eero Saarinen also designed the North Christian Church, which was completed in 1964, three years after Saarinen's death. Along with the First Christian Church and the Miller house, North Christian is one of Columbus' six national historic landmarks. Columbus, Ind., looks like any other small town, with its small shops and restaurants. But what sets this town apart is its architecture. The Modernist buildings — mostly geometric and made of glass and steel — are not immediately visible, interspersed as they are with old, 19th-century, gingerbread-like structures; but more than 60 public buildings in Columbus have been built by a veritable who's who of modern masters — I.M. Pei, Eero and Eliel Saarinen, Cesar Pelli, Richard Meier, Harry Weese, Robert Venturi and James Polshek, to name a few. In 1991, the American Institute of Architects rated Columbus sixth on its list of the top 10 American cities for architectural quality and innovation, right up there with Chicago, New York and San Francisco. That's pretty amazing for a town of just 44,000 residents. 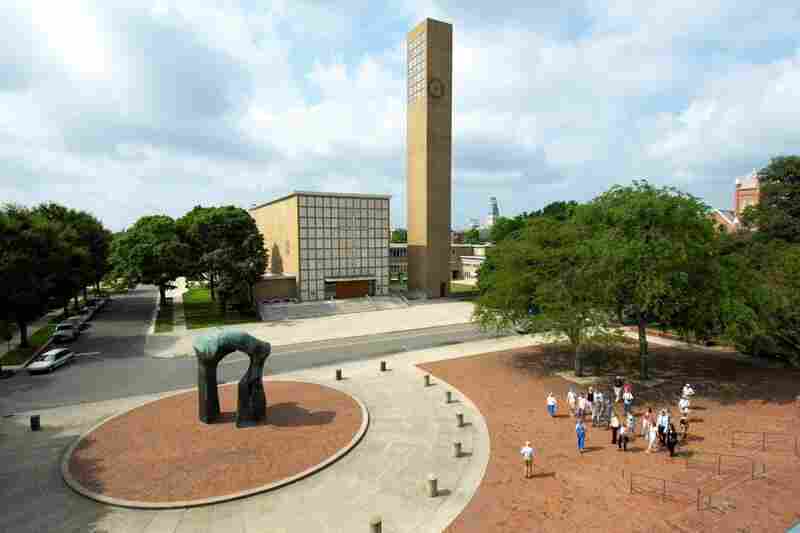 Six of the city's modern buildings have also been designated as national historic landmarks, and enough people travel from nearby towns and states — and even other countries — to see them that the local visitors center gives walking tours. This is Columbus. We don't build anything that isn't attractive. One such tour takes you past a large, arch-like sculpture by English artist Henry Moore. It sits across from a library designed by architect I.M. Pei and built in 1969. The building's facade is made of brick with nearly invisible mortar — Pei mixed red brick dust into the white mortar to make it blend in. The first modern building in Columbus is opposite the library. Finnish architect Eliel Saarinen built the First Christian Church in 1942. Grim and factory-like, the church has a tall, rectangular tower and small, rectangular windows. It helped launch a local design revolution that World War II promptly put on hold. Then, in the 1960s, thanks to some design-conscious decisions by the biggest business in town, the architectural revolution soared, with schools, fire stations, an all-glass bank, a courthouse, city hall, a world-class golf course and a jail — a really attractive jail. As tour guide Bob Bishop puts it, "This is Columbus. We don't build anything that isn't attractive." The force behind that philosophy is the Columbus-based Cummins Engine Co., or, more specifically, J. Irwin Miller, the company's longtime head. Nearly eight years after his death, Miller's values still inhabit the town. When J. Irwin Miller began working at Cummins in 1934, his responsibilities included opening the mail. He went on to transform the company through innovations in management, marketing and production. "Whatever you do in this world, you've got a responsibility and a privilege of doing it the very best way you can," Miller says in a company film clip. "And whether it is architecture or cooking or drama or music, the best is none too good for any of us." Miller's son Will, the youngest of five, was raised in Columbus. Today, he heads the Wallace Foundation (an NPR underwriter) in New York and sits on the Cummins board. Will Miller grew up in a stunning, light-filled, white marble and glass house by Finnish-American architect Eero Saarinen, son of Eliel Saarinen. 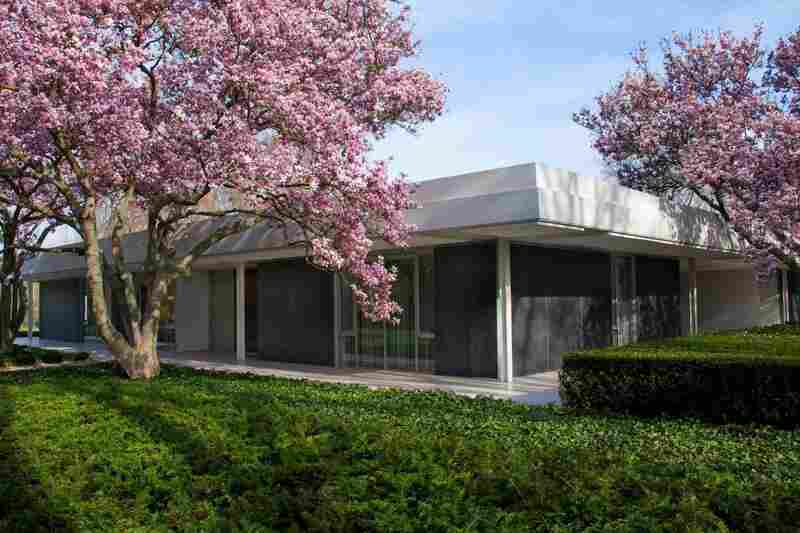 Completed in 1957, the home is open to the public by appointment and for a $20 ticket. Standing inside the house where he grew up, Will Miller says his parents had high expectations and standards. "All of us, when we were growing up, had to take piano lessons and practice every day," he recalls. "One morning, for some reason, my alarm clock went off at 4 in the morning. And I didn't pay any attention; I just came out here and started banging on the keyboard and my father appeared in the doorway over there and said, 'What are you doing?' And I said, 'Practicing. I have to practice.' And he said, 'It's 4 in the morning, go to bed!' And I said, 'But I've already practiced, right? I don't have to do it again.' "
In the mid-1950s, Will's father launched a program to subsidize public buildings in Columbus. He specified that the buildings be designed by great architects, because, as Will remembers his father always saying, "Mediocrity is expensive." "This was the early '50s," Will says. "The community was growing with the baby boom so rapidly that it became clear to the school system they would have to build an elementary school every two years in order to keep up with the demographics that they could see in the birth rates." Before J. Irwin started his program, a school had gone up that was built on the cheap — and it showed. Why would prospective Cummins engineers from MIT, say, who could work anywhere, want to raise families in a small town they'd never heard of with bad-looking schools? J. Irwin Miller had a business problem and a community problem. To solve them, he and his Cummins Foundation made the school board an offer they couldn't refuse: If the school system picked an architect from a list of five provided by the foundation, then the foundation would pay that architect's fees. Ten percent of the cost would be paid by Cummins, not taxpayers; there would be quality buildings and the decision would be made by public officials. The first school designed under the Cummins plan turned out so well that the school board wanted the deal again and so did other public authorities. Will says they still keep coming. It's an ongoing process and completely voluntary. "I've always made a distinction between building, sculpture and architecture. If it's space that physically encloses a human activity and functions at a reasonable level but has no capacity to elicit from you a desire to go further, think spiritually, worry about your fellow man, then it's just a building. If it's an enormously elaborate, beautiful, moving space that you can inhabit but it was designed as a symphony hall and you can't hear the orchestra in the back, then it's large-scale sculpture. Architecture to me is that fantastic combination of the two where it enhances and encloses human activity but it actually inspires you to do better." At a Cummins plant just outside town, the slogan "doing better" appears on workstation wall signs. In the ladies' room, one sign reads, "Treating people with dignity and respect is a core value at Cummins," and there are other signs about safety and health. Here in Columbus, the assembly line looks a little like Santa's workshop. The place is full of air compressors, engine blocks, pistons and things this former English literature major can't fathom. The handsome, modern plant is shiny and new. Business is good right now. In past years, Cummins has seen some layoffs, but it's also seen comebacks. Over on Second Street, at The Republic newspaper building — built by the architectural firm Skidmore, Owings and Merrill in 1971 — associate editor and county historian Harry McCawley says, in his 46 years in Columbus, he's come to appreciate Cummins' old-fashioned values as well as the newfangled architecture. Still, he says, "I think sometimes people in Columbus take themselves too seriously. 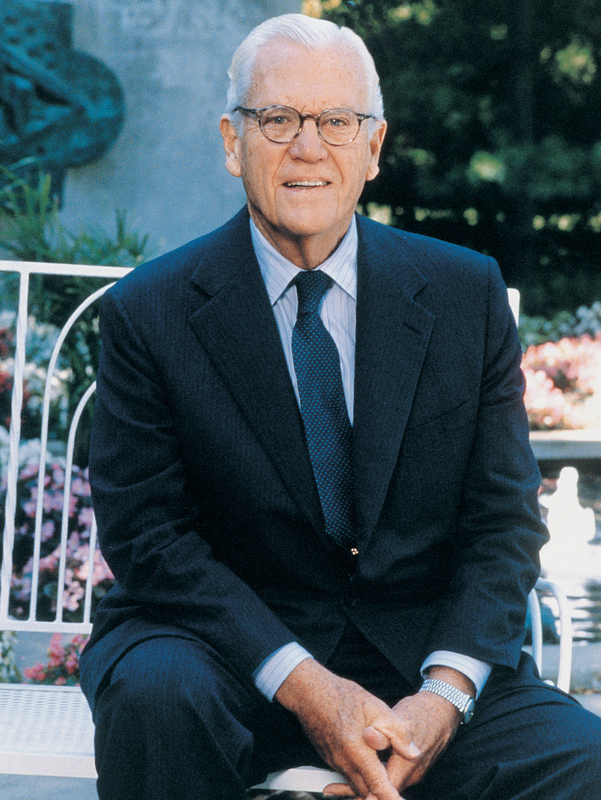 And they, for instance, look upon J. Irwin Miller as this marvelous benefactor, which he undoubtedly was. But I think he was a businessman and so many of the things that have been done have had a dual result: It's benefited the community, no question, but it's also benefited the company." Part of Zaharakos restoration involved replacing its '50s-era storefront with a 19th-century design that better matched its interior. 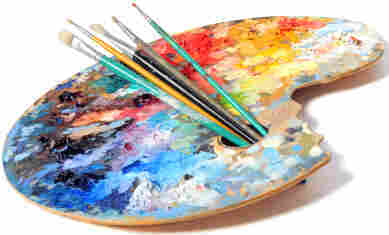 The result can feel anachronistic, considering the town's more contemporary claims to fame. 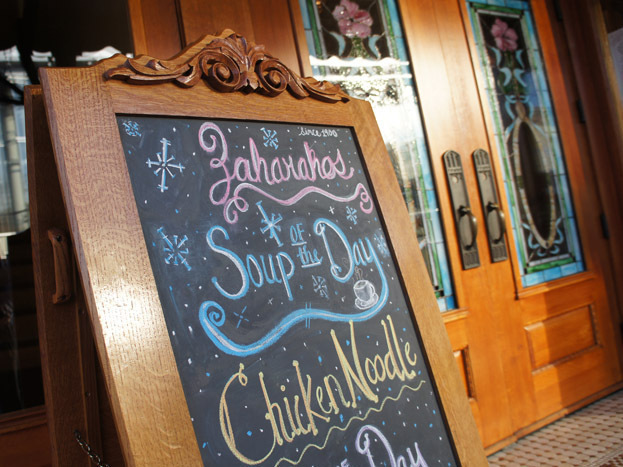 Tourists may come to Columbus for the modern architecture, but they can't leave without stopping at Zaharakos, an ice cream parlor that was built in 1900 and restored in 2009. It's full of brass chandeliers, dark woodwork, marble counters and a self-playing organ. Wilma Hare, 71, is pouring hot fudge sauce behind the counter. An old-fashioned place like Zaharakos amid Columbus' other modern buildings can be anachronistic, but Hare says she likes having the past around. "There's good things in the past. There was bad, but there's good things in the past and we need to hang on to the good things," says Hare, who's spent most of her life in Columbus. When asked what she thinks of all the new buildings, she laughs. "Oh, don't get me started." Smiling, she plunks a maraschino cherry on top of whipped cream on top of caramel sauce on top of vanilla ice cream. Then Wilma Hare looks out the parlor windows at the passing parade of neighbors — and, thanks to J. Irwin Miller, plenty of visitors, too.